If cranberries decorate your Thanksgiving table or a Christmas wreath adorns your home, you might have Margarita Reyes Pacheco to thank. She’s a Mexican immigrant farmworker who spends 10-hour days picking berries and weaving wreaths, which Spanish speakers call coronas, until her hands ache so much they wake her at night. 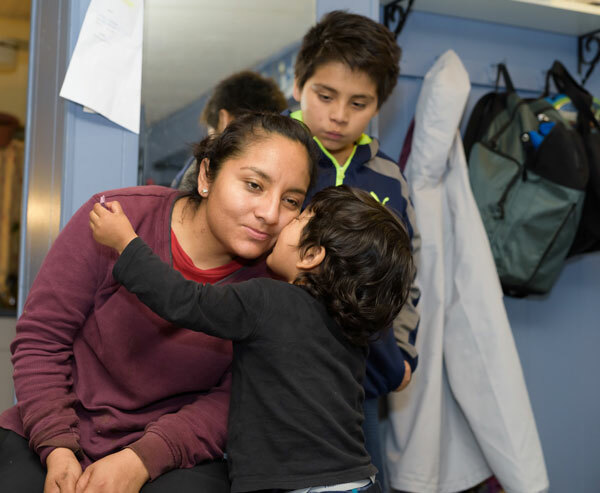 Reyes Pacheco came to the United States without documentation as a 15-year-old, brought by her first husband, whom she eventually left because of domestic violence. She first became a “Dreamer” under the Deferred Action for Childhood Arrivals program and now has a “U visa” for domestic abuse survivors. She has three children, all U.S. citizens, and a second husband who was deported. His name is Alejandro. Even if you don’t eat cranberries or buy wreaths but love guacamole, you might have him to thank: He’s an avocado farmer in Toluca. Reyes Pacheco’s story offers a look under the surface of our immigration problems, revealing truths more complex than the polemic narratives of political leaders. Hers is a life framed by work and supported by “sanctuary” communities willing to stand up to government tactics one Latino leader compares to the Gestapo. Few issues have been more controversial since President Donald Trump took office than immigration. In Portland, the crackdown by Immigration and Customs Enforcement led to a Facebook video viewed a million times that showed ICE agents trespassing while detaining a suspect. In a separate incident that the American Civil Liberties Union of Oregon called “Nightmare at PDX,” a Spanish college student was sent to the Northern Oregon Regional Correctional Center, a jail in The Dalles that regularly holds ICE detainees, for a minor visa violation. Ramón Ramírez, president of the largest Latino union in Oregon, Pineros y Campesinos Unidos del Noroeste (PCUN), described ICE raids as fascist. Since 2015, when he announced his bid for president, Trump has hammered on the theme that Mexican immigrants are criminals. However, according to several studies, immigrants are less likely to commit crimes than non-immigrants. The worst crime Margarita has committed, she said, is driving without insurance. Asked about Trump’s build-a-wall politics, she sighed. Margarita Reyes Pacheco is a single mother of three. She is married, but her husband was deported to Mexico. She has considered moving back to Mexico to be with her husband once her children, who are U.S. citizens, are grown. Reyes Pacheco’s weekdays start before 6 a.m. in a mobile home in Forest Grove. She feeds Michael, Christopher and José Manuel breakfast, then they have a daily video chat with her husband, Alejandro – father to José Manuel – before she drops them off at school and heads to work. During the year, she shifts between planting and picking vegetables and berries in Washington County farm fields and working two months making Christmas wreaths by hand for an employer she declined to name. In years past, she’s worked an evening job in a restaurant in addition to her full-time day job to make ends meet. She makes good money with the wreaths – $4,000 a month – but pays a third in taxes and goes without work in January and February. She has her own plot at a community garden that reflects her roots in a small Mexican pueblo named San Esteban Atatlahuca, two hours from Oaxaca, Mexico, the place where cacao (chocolate) beans originated. During the latest season, she planted so many chilies she lost track of which were which. That’s no small matter when some are spicy chocolate habañeros. “I had to start tasting them to find out if they were spicy or not,” she recalled, laughing. Once a week, Reyes Pacheco said she takes her three kids to a restaurant so they can eat their fill. Their favorite is Juan Colorado. Her own dream is to someday start a Oaxacan bakery. The work making coronas is “very painful,” Reyes Pacheco said. Now 30, she’s done it annually since she was 18 or 19. Smaller ones pay $1.30 each; more elaborate ones pay $3 each. She can do 75 of the larger ones in a day, or 105 smaller ones. This is hardly news to Rebeca Velazquez, who leads Mujeres Luchadoras Progresistas, a Woodburn nonprofit that supports women with health care and self-esteem building. Velazquez said the politics around immigration often overlook women. Every year since 1992, Velazquez’s group has made Christmas wreaths, to be sold in to Portland, Eugene and Seattle. This year, a portion of their 1,200 coronas will be sold at Grand Central Bakery on Southeast Hawthorne Boulevard in Portland. Among the 170 women who made the wreaths are documented and undocumented workers, field workers, housewives, domestic violence survivors and sexual assault survivors, she said. Imagine a trip to see your father for the first time – a man you know only through a computer screen. PCUN’s Ramírez became emotional when told of José Manuel’s daily video chats with his dad. It struck a personal chord. “In my case, that’s my son-in-law. That’s the father of our grandkids,” Ramírez said. Ramírez said ICE raids and deportations don’t just affect an estimated 11 million undocumented immigrants, but ripple out to 58 million Latinos in the U.S.
Reyes Pacheco and José Manuel visit Alejandro as often as possible, but the trips are expensive. The pair are working with an attorney and the Mexican Embassy here “but are now thinking that he’s not eligible to come back,” Reyes Pacheco said. Alejandro was deported in 2010 and has considered crossing the Sonoran Desert illegally to come back, Reyes Pacheco said. Reyes Pacheco also has to pay for her own documents, she said. Each new application for legal residency, whether DACA or a U visa, costs several hundred to more than a thousand dollars, not including attorney’s fees. It’s a lot for a single mother of three. Alejandro doesn’t make enough growing avocados to contribute. If not for the health problems of her eldest child, Michael, Reyes Pacheco might still be in Mexico herself. She went back to Oaxaca in 2007, she said, intending to stay. But when Michael got sick, they went to a Mexican hospital, and his situation didn’t improve after two weeks, so she sent him back – on a plane, because Michael is a U.S. citizen. She then spent three days walking across the Sonoran Desert because she didn’t have legal documentation. She and other migrants were robbed by masked men. Lately, she’s started thinking about a day when her children are grown and whether she’d move back to Mexico to be with Alejandro. Research suggests this relocation has become commonplace in recent years. More Mexicans now move back to Mexico than come to the United States. Velazquez, of Mujeres Luchadoras Progresistas, said some immigrants are experiencing the ending of la ilusión – the illusion. The illusion, Velazquez said, is the belief that our immigration problems will someday end. It’s possible la ilusión grows from what Ronald Reagan did in 1986. The Immigration Reform and Control Act granted green cards to 2.7 million undocumented immigrants. Now, under another Republican, the pendulum has swung the other way. If Reyes Pacheco were to return to Mexico, who would take care of the couple’s three children? Who would pick the cranberries or make the coronas? Ann Marie Moss, spokesperson for the Oregon Farm Bureau, said a “shrinking labor pool” lately has affected fruit orchards, nurseries and greenhouses across the state. “A lot of farmers (in those industries) have had a hard time finding enough labor to harvest everything,” Moss said. The U.S. government has long been involved, on behalf of big agricultural interests, in bringing Mexican farmworkers to this country. PCUN’s Ramírez said that now, as then, farmworkers must overcome huge barriers to become successful. “Farmworkers are America’s most important workers because we’re the ones that put food on the table, but yet we’re not afforded the same rights,” Ramírez said. “We don’t have collective bargaining rights, paid vacation, paid holidays, seniority. Reyes Pacheco giggled when recalling non-Latinos who joined laborers in the fields. Many lasted as little as a half-hour, she said. While migrant farmworkers are a population that tends to stay out of the spotlight – and farmers are hardly eager to talk about using undocumented labor – it’s possible the ICE crackdown has contributed to a shrinking farmworker labor pool and crop losses in Oregon. Reyes Pacheco said six or seven workers who usually make the wreaths aren’t around this year. Low unemployment and a strong economy may also be factors. Reyes Pacheco doesn’t pretend to have the answers, but she knows work can set you free. Outside a tiny town called Gales Creek, down a gravel road tucked behind tall stalks of corn, a few dozen people gathered under a structure that recalled a Mesoamerican palapa – an open-air, thatched-roof shelter. They were there for an event, organized by Forest Grove-based Adelante Mujeres, featuring “meet the farmer” chats with immigrants who work in agriculture. Margarita Reyes Pacheco was one of them. “She’s been the biggest producer of all,” Liliana Morgan said about Reyes Pacheco. Morgan is a sales distributor and marketing coordinator for Adelante Mujeres. The event was about food and agriculture. But it also hinted at a growing “sanctuary” movement with deep roots in Oregon. In 1987, Oregon became the first state to pass laws barring state and local agencies from asking about an individual’s immigration status or disclosing information to federal officials, except in some circumstances. Cooke said the recent Immigration and Customs Enforcement crackdowns contribute to “toxic stress” for many immigrants, documented or not.